Peace-building in the 21st Century – join people from across the capital on Monday 15 September at St Ethelburga’s Centre for Reconciliation and Peace. Download the flyer and register online. From the crises in the Middle East, to reducing conflict in our homes and streets, this timely conference engages scholars, experts, faith and community leaders to discuss the limits and challenges of grassroots peace endeavours, learn peace-building skills, and explore conceptual frameworks governing peace and dialogue. Here is an opportunity to listen to participants from different religious and cultural traditions, contribute our own insights and experience, refresh our conflict transformation skills, understand the hopes and fears of communities here and overseas, and take an active part in workshops and panel discussions. Workshops include: Conflict Resilience, Dialogue Skills, Advancing Peace through the Arts, Hostage Negotiations. 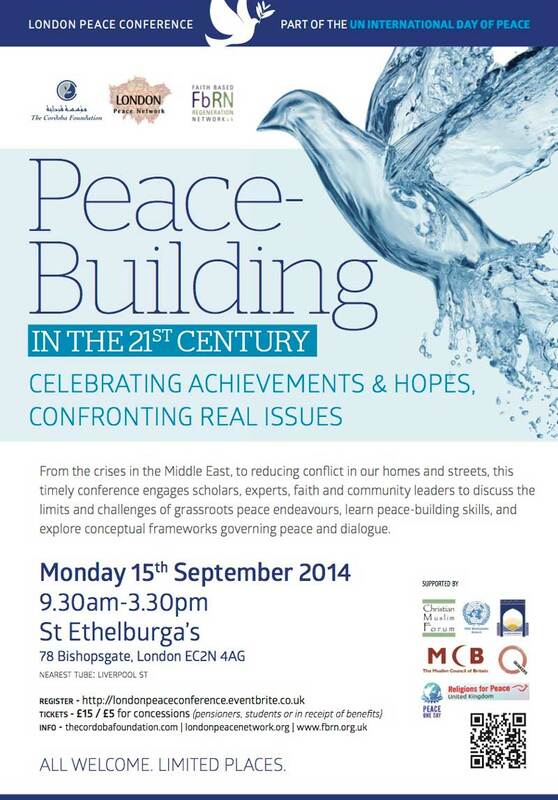 Panels include: Peace versus War, Grassroots Peace-building, Conflicts in the Middle East, Peace or Appeasement? The Muslim-Jewish arts group MUJU will be showing us their latest work on the theme of peace and Sikh students will be singing at lunchtime. The Christian Muslim Forum, the Faith-based Regeneration Network and many others will be participating. Register online now – your contribution of £15 (£5 students/pensioners/concessions) will help cover costs and includes lunch. St Ethelburga’s is a beautiful and poignant venue but space is limited, so book ahead if you plan to attend. The full programme will be available next week. If you would like any further information, please visit the London Peace Network or get in touch. This entry was posted in Corporation of London, UN International Day of Peace by Catriona Robertson. Bookmark the permalink. Dear Catriona, This looks fantastic. I am so sorry I am unable to make it myself. Peace, Steven.